The U.S. military presence in Africa, which has been growing steadily since the years following the 9/11 attack, has been having a spotlight in U.S. media after the death of four U.S. soldiers in Niger on October 4. But despite numerous questions raised, and the prominent attention given to the characteristically obtuse and insensitive response from the White House, the questions raised have been at best half-answered. And fundamental questions about counterterrorism strategy and U.S. policy were left unasked in the Washington-focused debate. While the Pentagon review about the details of the incident continued, and there were debates about both intelligence failures and whether the mission was in fact only "training and reconnaissance" or also a botched effort to target a "high-profile target," questioning of existing policy was muted. Administration and congressional hawks focused on providing more resources to double-down on U.S. military involvement. Congressional critics focused on the lack of updated authorization and called for a full debate on counterterrorist military operations around the world, but the momentum for such debate quickly faltered. The outcome to date appears to be much wider awareness of the extent of U.S. involvement, based on investigative reporting as well as the military's own reports which previously attracted little media attention. But there was little if any sign of questioning the basic premise of U.S. strategy centering military responses to terrorist threats around the world. Even the critics who pointed out the ineffectual and even counterproductive results of U.S. policy made little effort to address the question of what should be done by African governments or multilateral efforts to counter real terrorist threats. This AfricaFocus Bulletin contains a selection of very brief excerpts from coverage related to these debates over the last six weeks, in each case with a link to the full article. Some provide some partial answers; most leave more questions than answers. And key questions remain unasked. Another AfricaFocus Bulletin sent out today (and available at http://www.africafocus.org/docs17/cve1711.php) highlights more substantive discussion about one fundamental question only hinted at in Washington debate, namely, whether counterterrorism policies, whether by the United States or other actors, is not only ineffective but also counterproductive, serving to increase rather than decrease future terrorist threats. That, of course, is an issue which is not limited to Africa. But the default response in Washington to "double-down" on military engagement in the Sahelpromises not more security for Africa and the United States, but less. What happened and what is the U.S. doing in the Sahel? Niger hosts one of the largest numbers of U.S. troops in Africa. In June, the White House reported to Congress that some 645 U.S. military personnel were stationed there to support counterterrorism operations by "African partners." More recent news reports have cited 800. These figures show a significant increase since 2013, when President Obama announced the deployment of about 100 military personnel to Niger for regional intelligence, surveillance, and reconnaissance (ISR) operations. This trend has coincided with sizable increases in U.S. security assistance for African countries over the past decade, of which Niger has been a major beneficiary. In addition to conducting security assistance and cooperation activities in Niger and neighboring states, the U.S. military also provides logistical and intelligence support to France's Operation Barkhane. Four U.S. soldiers, four Nigerien troops, and an interpreter died in the Oct. 4 battle. It was a bitter reminder to the 3rd Group that it was no longer in Afghanistan, the combat theater where the Fort Bragg, North Carolina-based unit had been focused from 2002 until late 2015. There, its teams could call in airstrikes often instantaneously and almost always within minutes. But since switching from Afghanistan to North and West Africa, the group has had to grapple with what its veterans repeatedly refer to as the continent's "tyranny of distance," combined with a paucity of resources when compared with mature combat theaters like Iraq and Afghanistan. "You had a shitload of resources in Afghanistan — even when it was underfunded, compared with Iraq — that you don't have in Africa," the former officer said. Karen Attiah, "After Niger, ramping up U.S. 'agression' in Africa is a really, really bad idea," Washington Post, Oct. 24, 2017 http://tinyurl.com/y7c66xfp - includes excellent 3-minute video "Just what the heck is the U.S. military up to in Africa?" In the absence of answers, and a lack of a clear and coherent Africa strategy to begin with, ramping up U.S. military aggression in Africa sounds like a really, really bad idea right now. On Thursday, asked about why U.S. troops were in Africa, White House Chief of Staff John F. Kelly said, "They're there working with partners … teaching them how to be better soldiers; teaching them how to respect human rights …" However on Friday, the Post reported that the Pentagon was adopting a "status-based targeting" system for suspected terrorists, meaning troops will be able to use lethal force against a suspected member of a terrorist organization even if that person does not pose an immediate threat." This should make anyone who cares about human rights and effective counterterror strategy quite nervous. Looking back, 16 years later, it's extraordinary how September 11, 2001, would set the pattern for everything that followed. Each further goading act, from Afghanistan to Libya, San Bernardino to Orlando, Iraq to Niger, each further humiliation would trigger yet more of the same behavior in Washington. In twenty-first-century Washington, failure is the new success and repetition is the rule of the day, week, month, and year. Take, for example, the recent events in Niger. Consider the pattern of call-andresponse there. Almost no Americans (and it turned out, next to no senators) even knew that the U.S. had something like 900 troops deployed permanently to that West African country and two drone bases there (though it was no secret). Then, on October 4th, the first reports of the deaths of four American soldiers and the wounding of two others in a Green Beret unit on a "routine training mission" in the lawless Niger-Mali border area came out. The ambush, it seemed, had been set by an ISIS affiliate. And suddenly U.S. Africa Command was highlighting its desire for more money from Congress; the military was moving to arm its Reaper drones in Niger with Hellfire missiles for future counterterrorism operations; and Secretary of Defense Mattis was assuring senators privately that the military would "expand" its "counterterrorism focus" in Africa. The military began to prepare to deploy Hellfire Missile-armed Reaper drones to Niger. "The war is morphing," Graham insisted. "You're going to see more actions in Africa, not less; you're going to see more aggression by the United States toward our enemies, not less; you're going to have decisions being made not in the White House but out in the field." The mission never made the front page of the New York Times or the Washington Post. It wasn't covered on CNN or Fox News. Neither the White House chief of staff, the chair of the Joint Chiefs of Staff, nor the president ever addressed it in a press briefing. But from mid-January to late March 2013, Green Berets from the 10th Special Forces Group deployed to the impoverished West African nation of Niger. Working alongside local forces, they trained in desert mobility, the use of heavy weapons, and methods of deliberate attack. On May 15 of that year, another contingent of Special Forces soldiers arrived in Niger. For nearly two months, they also trained with local troops, focusing on similar combat skills with an emphasis on missions in remote areas. From the beginning of August until mid-September, yet another group of Green Berets traveled to the hot, arid country for training, concentrating on desert operations, heavy weapons employment, intelligence analysis, and other martial matters, according to Pentagon documents obtained by The Intercept via the Freedom of Information Act. "Simply throwing more money at the existing programs and doing what we've been doing — but just simply more of it — strikes me as a really bad idea," [RAND Corporation analyst Michael] Shurkin added. "At the very least, we're going to waste a lot of money. And we can definitely make things worse." Our central finding is that effective SFA is much harder in practice than often assumed and less viable as a substitute for large unilateral troop deployments. For the US in particular, the achievable upper bound is normally modest, and even this is possible only if US policy is intrusive and conditional, which it rarely is. This is because SFA is best understood as a principal-agent (PA) problem, and one whose structural conditions promote large agency losses for the SFA provider. That is, the conditions under which the US provides SFA commonly involve large interest misalignments between the provider (the principal) and the recipient (the agent), difficult monitoring challenges and difficult conditions for enforcement - a combination that typically leaves principals with limited real leverage and that promotes inefficiency in aid provision. For the foreseeable future, small footprints mean small payoffs for the US - where limited US interests preclude large deployments, major results will rarely be possible from minor investments in SFA. ... But SFA's real costs and risks are easy to underestimate, and its military benefits have often been oversold. Overuse is thus a real danger: SFA can help, but only rarely will it provide major effectiveness improvements from modest investments in training and equipment. The links between militant groups in the region - whether identified as "jihadist" or not - are often fluid and belie easy categorisation. This label obscures a situation which deserves much more consideration before pulling the trigger. And it takes attention away from the experiences of local populations who are often stuck between militant groups and sometimes hostile governments and foreign armies. "When Donald Trump was elected president of the United States (US) in January, many wondered what his administration's policy towards Africa would be. Ten months later, it is clear that regarding security at least, a reduction of the US cost burden for United Nations (UN) peacekeeping, combined with increased direct US military engagement and a preference for bilateral support, are key pillars. ... these approaches risk constraining the capacity of nascent African initiatives that require predictable support not only on a bilateral level, but also from the UN. The US continues to support the fight against extremist groups in the Sahel, Lake Chad Basin and the Horn of Africa. However Trump's insistence on reducing US financial aid has affected many areas of cooperation with Africa on peace and security. This includes blocking proposals to use UN-assessed contributions to support African peace security operations like the African Union Mission to Somalia (AMISOM) and the G5 Sahel mission. The US has instead pursued a more bilateral approach. 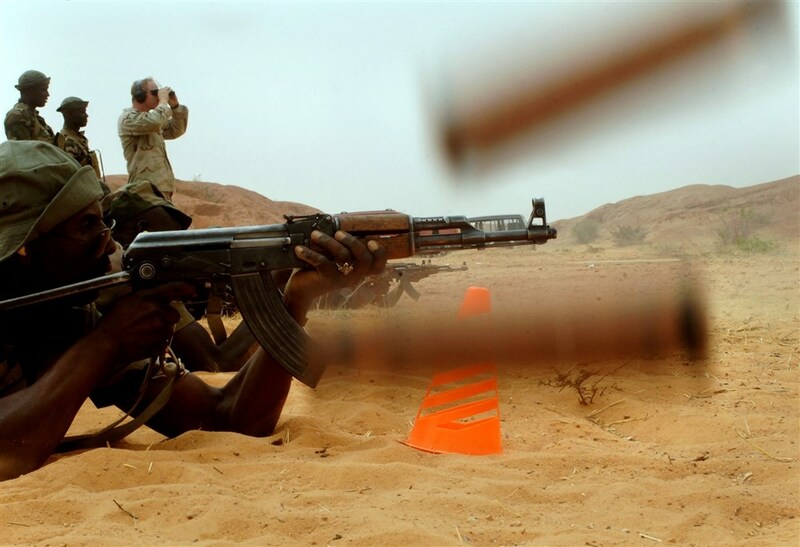 Maradi, Niger - A Nigerien soldier from the 322nd Parachute Regiment shoots during target practice facilitated by 1st Battalion, 10th Special Forces Group (Airborne) Soldiers April 3, 2007. The training is part of Operation Flintlock 2007 which includes an interactive exchange of military, linguistic and intercultural skills for Niger and the U.S.
For in-depth background analysis and first-hand reporting on conflict in the Sahel region, two extremely useful sources are the IRIN humanitarian news service and the International Crisis Group. An excellent overview from early 2016 by IRIN's Africa editor Obi Anyadike is "Briefing: The new Jihadist strategy in the Sahel." Three particularly relevant articles from 2017 on Niger, Mali, and Burkina Faso are the following. "Niger and Boko Haram: Beyond Counter-insurgency," 27 Feb. 2017. "The Social Roots of Jihadist Violence in Burkina Faso's North," 12 Oct. 2017. UN Secretary-General António Guterres recently told the Security Council, which votes today on whether to fund the nascent multinational military force, that supporting it was "an opportunity that cannot be missed" and that failing to back it would carry serious risks for a region where insecurity has become "extremely worrying". The Security Council "welcomed the deployment" of the force in a resolution adopted in June, but put off a decision about financing. The resolution's wording was the subject of a prolonged tussle between France - the G5 force's main proponent - and the United States, which didn't believe a resolution was necessary, sees the force's mandate as too broad, and, as the world body's biggest contributor, isn't convinced the UN should bankroll it. On Friday, US Ambassador to the UN Nikki Haley said Washington wants to know "what the strategy would be, how they see this playing out, what's involved in it, before we ever commit to UN-assessed funding". France has been working hard to win over the United States. On a visit to Washington last week, French Defence Minister Florence Parly said the former colonial power had no desire to become the "Praetorian Guard of sovereign African countries". In 2013 and 2014, France's Operation Serval drove back militants in Mali's northern desert from some of the towns and other sanctuaries they had taken. With attacks nevertheless continuing and having spread beyond Mali's borders, 4,000 French troops are currently deployed under the banner of Operation Barkhane across all the G5 states. Mali is also home to the 14,000-strong MINUSMA force, one of the UN's most expensive peacekeeping missions. It has come under frequent attack by militant groups such as the Jama'a Nusrat ul-Islam wa al-Muslimin (JNIM), an al-Qaeda-linked coalition forged last March. Some 86 blue helmets have been killed in militant attacks since MINUSMA was established in July 2013. Meanwhile, efforts by civil society groups to negotiate with some jihadist groups have come to nought, while parties to a 2015 peace agreement between Mali's government and two coalitions of domestic armed groups - a deal that excluded the jihadists - are embroiled in violent divisions among themselves. Some of these domestic groups are also responsible for attacks against the state. These divisions have dimmed hopes of forging any kind of common front against the jihadists, and even of properly implementing the 2015 accord. The government's failure to address widespread political and economic grievance further undermines its position. All this insecurity comes at a high price for Mali's civilians. At the end of the 2016-17 academic year, 500 schools were closed, up from 296 the previous year, while the numbers of refugees and internally displaced reached a record 140,000 and 55,000 respectively. Acute malnutrition among children under five has reached "critical levels" in conflict-affected areas around Timbuktu and Gao, according to UNICEF. The agency predicts that 165,000 children across the country will be acutely malnourished next year. "Repeated criminal acts" prompted the International Committee of the Red Cross to suspend its operations in the northern Kidal region in mid-October. The primary mandate of the G5 force will be to secure the bloc's common borders and fight "terrorist" and criminal groups. The force's headquarters were established in September in the central Malian town of Sévaré, but its financing has yet to be secured. "Estimates still vary; nothing has been settled," said a diplomat who has followed the latest developments. "If we get to 250 million euros at the donors' conference in December, that would be very good. But even if financing is obtained in December, the force will not be operational the next day." "Mobilising sustainable and consistent financial support over a period of several years will remain a significant challenge," conceded Guterres in his report. "The Burkina military believe their Malian counterparts are 'lazy' and joined the army to get an income and not to defend the country," the International Crisis Group said, for example, in its latest report on Burkina Faso. Given how often existing forces in Mali, including the army, are attacked (losing weapons and vehicles in the process), deploying yet more troops in the region carries a real risk of further boosting jihadists groups' military assets. "Malian armed movements have employed an increasing proportion of heavy weaponry from Malian government stockpiles - particularly ammunition for larger weapon systems such as rockets and artillery - as opposed to Libyan or other foreign sources," Conflict Armament Research said in a 2016 report on the Sahel. Human Rights Watch recently reported on "killings, forced disappearances and acts of torture" committed by security forces in Mali and Burkina Faso against suspected members of jihadists groups. "The fighters are found among the greater population, are part of them and live with them. It is not easy to identify them. That makes combat difficult, even if there are far fewer jihadist than soldiers," explained Ibrahim Maîga, a researcher with the Institute for Security Studies. "You can't defeat these people without helping the population caught in the middle. One side accuses them of being terrorists, the other of collaborating with national or foreign armies. This is why it is imperative that the state gains more legitimacy," he added. The G5 joint force's first operations are expected to take place in the LiptakoGourma region, where the borders of Mali, Niger, and Burkina Faso meet. These states have been particularly affected by the attacks carried out by JNIM, Islamic State in the Greater Sahara, and Ansarul Islam against national and foreign security forces. On 21 October, 13 gendarmes were killed when their barracks in Ayorou in Niger's Tillaberi region came under attack. Fulani youth - too simplistically - are seen as ready recruits to jihadist groups, and Nigerien Tuareg militia are being used by the government to hunt them. None of the groups operating in the region has claimed responsibility for the 2 October attack in which four US and four Nigerien soldiers were killed 200 kilometres north of Niamey - an attack a top US general has attributed to a local IS-affiliated group. The incident served to bring international attention to US military presence in the region, described by some media as a "shadow war" at a time when the US is in the process of moving its drone operations from Niamey to the central Niger town of Agadez. "Our American colleagues believe the [Niger] attack against their troops exposes a dilemma: Do too much and be exposed, or don't do enough," a French diplomat remarked. It seems the Pentagon is going for the first option: US Defense Secretary James Mattis recently informed Congress that the United States was increasing its antiterrorism activities in Africa and that new rules of engagement were being introduced, allowing troops to open fire on mere suspects.